From the moment you’ve identified a concern in your child’s behavior, we are there for you. The Early Start Denver Model (ESDM) is a curriculum used by St. Louis Arc therapists when interacting with children with an autism spectrum disorder between the ages of 12 to 48 months. The program stresses that children learn best when they are able to initiate socialization between other children and adults. 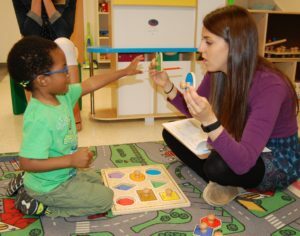 Our therapists work with children in a preschool setting by providing 1:1 support. Additionally, ESDM therapists provide individual treatment with each child in their home. One of ESDM’s more distinguishing traits is the importance that it places on parental involvement. Parents attend a seven week training course that teaches them tactics on how to better understand, engage, and communicate with their child. The ESDM curriculum utilizes a format that can be used by professionals, parents, and caregivers to work with infants and toddlers in their natural learning environment and throughout their daily routines. St. Louis Arc therapists include OT, speech, BCBA, special educators, and behavior technicians. Our program is one of only a few in the state with therapists who are trained and certified in the Early Start Denver Model. 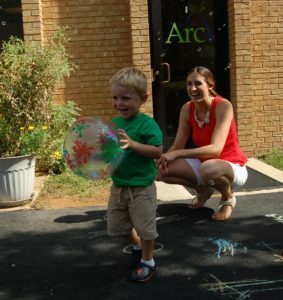 The St. Louis Arc offers Applied Behavior Analysis Therapy (ABA) to increase or decrease socially significant behaviors and teach new skills. Therapy is provided in the child’s home, school, community, or our center. For more information on the ESDM program or ABA Therapy, contact Theresa Strothkamp, Director of Behavior and Autism Services, at 314-817-2258.